Our awesome dunk tanks have been delighting crowds for years. The concept of dunking the boss at the company picnic, or dunking the local "celebrity" at fundraiser events has become an American pastime. 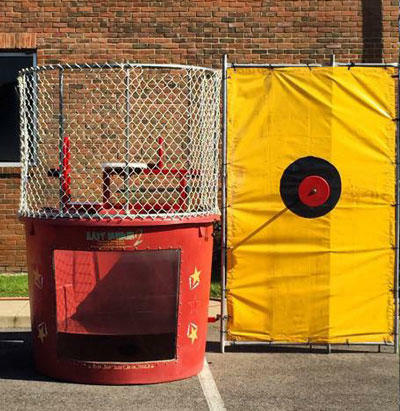 The Dunk Tank has always been a leading money maker at fairs, carnivals, and block parties and it is an excellent choice for fundraising for churches and other non-profit organizations. 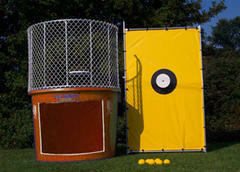 500 gallon dunk Tank- WITH WINDOW- Dunk your friends, boss, family...etc!! 4 balls included. YOU SUPPLY THE WATER!